Thought I’d keep it cool today with a bit of a chatty post. So I’ve decided I’m going to start writing a diary again. When I was younger, maybe 10/11 I kept a diary every single day for two years. I think thats pretty impressive to say the least. Last year I actually purchased ‘Q&A a Day: 5-year Journal‘. This was simply to ease me back into the whole writing a diary thing, as I couldn’t commit to doing it fully every day. 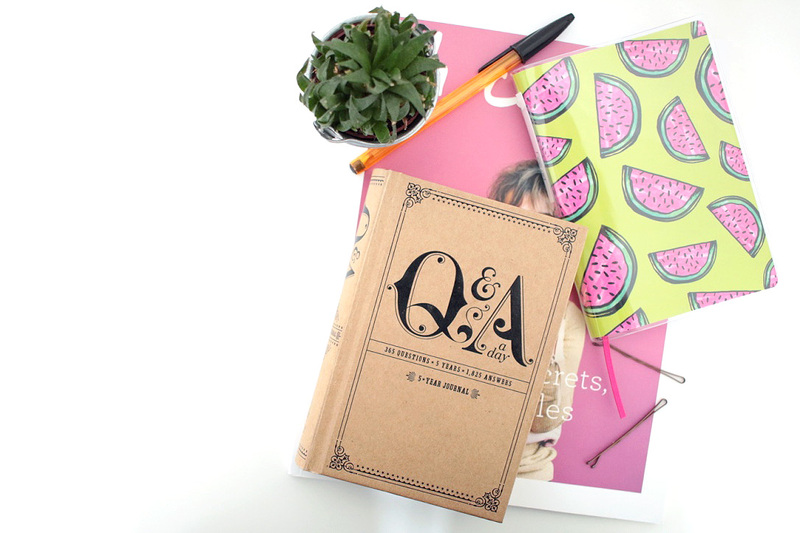 I really enjoy my Q&A a Day journal, as it asks you questions instead of you writing whats on your mind. Its pretty cool. But the other day I went to Paperchase and picked up this gorgeous watermelon notebook. It was so cute I couldn’t resist buying it, plus it was only £4.50, bargain. Anyway onto why I actually want to keep a diary. 01. Its something to look back on. One simply cannot remember every single day of their life just through memory so to write it all down means that you might read back over things you totally forgot about. 02. You can remember all the fantastic memories you’ve made. I’m such a sentimental person and love remembering the good ol’ times, and reading back over them is always a pleasure. 03. Writing down your feelings. Its always good to share your feelings so if you don’t want to talk to anyone directly, you can just jot them down instead. 04. You can learn. I definitely won’t just be writing down the good times, but including the bad. As someone who suffers with anxiety I think its good to write down how you feel and be able to look back and learn from that particular situation. 05. Its just fun. When I was younger I wanted to be an author, although that dream has slowly faded my secret love for writing hasn’t. I enjoy writing things down, nothing beats pen on paper.